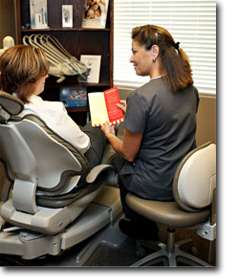 We realize you are busy, and sometimes put dentistry on the back burner. Our office knows our patents are pressed for time. We commit to quality dentistry for our patients, but realize that efficiency and expediency are also factors in everyone’s life. We emphasize the preservation of natural teeth, which includes thorough examinations and the taking of appropriate records for each patient. We also encourage timely visits for follow up checkups and routine prophylaxis (cleaning) with our highly skilled Hygienist. When you come to our office for treatment, everything will be planned and organized for you, so you can plan your time accordingly. Value is another important ingredient that goes into our decision making process. Our Team acknowledges this, and we do everything possible to service our patients in a kind and caring manner while keeping your budget in mind. We have a wonderful and informative program for our patients, with regard to the treatment of gum tissue. More people lose their teeth due to periodontal disease, than any other reason. We help many patients fight this disease and maintain their teeth for a lifetime. Periodontal Disease is associated with frightening thoughts for most of our patients. They have heard about experiences from other people, and when they come to our office they are afraid and feel out of control with their own periodontal situation. With Dr. Hart’s knowledge and the skills of our highly trained Hygienist, we can extinguish most fears of this disease and put many patients back in control of their periodontal disease without surgery. Our patients are given the tools they need with proper maintenance in our office and home care instruction to be able to manage this chronic disorder.